Get free Twitter analytics from Union Metrics! 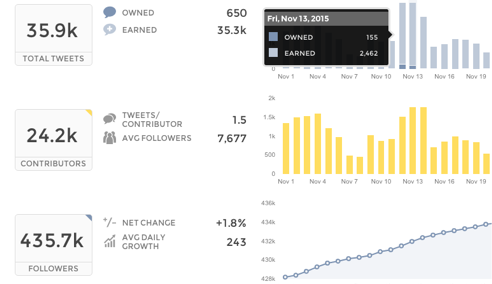 Introducing a brand new way to get quick answers to your biggest Twitter questions with our free snapshot report. Analyze recent conversation about anything on Twitter – your account, your competitors, a campaign, a hashtag, a trend, a Tweet. Really, any topic you can think of. Want to see how you’re doing on Twitter? 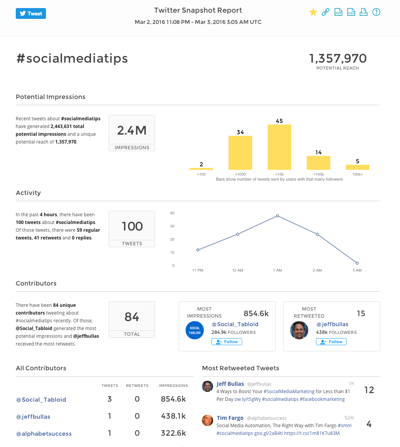 Perfect for quick, digestible metrics on recent Twitter activity around a hashtag, Tweet, keyword or account, Union Metrics Twitter snapshots provide insight into metrics such as reach, impressions, top Tweets and contributors. They’re fast, free and include up to 100 Tweets from the past few days. Need more than just a snapshot?